This was super yummy! My dad is a cattle rancher, so usually I want my steaks plane with just some garlic salt and pepper and cooked on a really good charcoal grill, but this was really good. I actually like the flavor of blue cheese, but my husband hates it. So I was a little apprehensive whether or not he was going to like this, and he did. The Blue Cheese butter does have the flavor of the cheese, but it has enough going on that it’s not like eating straight blue cheese and it compliments the flavor of the beef really well, so don’t be afraid to try this. All and all, a definite must try recipe. To make the blue cheese butter, mash together the softened butter, garlic, cheese and sage until they are well combined. From the mixture into a log and wrap it in baking paper, twisting the ends to seal them. Refrigerate the butter until firm, then cut into 5mm (1/4 in) slices and leave it at room temperature until needed. Cut the beef into four thick, equal pieces and tie a piece of string around the edge of each so it will keep its shape during cooking. Brush both sides of each steak with the oil and season with freshly ground pepper. Heat a barbecue to medium-high direct heat and cook the beef on the chargrill plate for 6-7 minutes each side for medium, or to you liking. 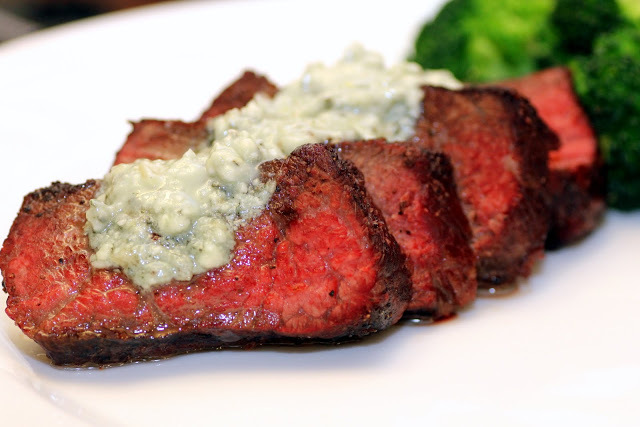 Put two slices of blue cheese butter on top of each steak as soon as you remove it from the barbecue and remove the string. Note Any leftover butter can be wrapped in baking paper and foil, and frozen for up to 2 months. It is also delicious with chicken and pork.